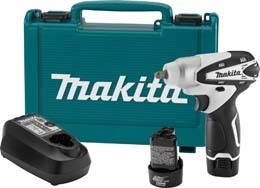 Lay down that heavy drill and pick up one of these lightweight, compact impact drivers. You’ll get the job done easier because these tools have serious power for their size. Even better, they won’t twist your wrist while they work. Let’s look at these three drivers to see which one will be the best for you. We’ll start off with the DCF886 that DeWalt released in 2013 as an upgrade to the DCF885. Where the DCF885 has a brushed motor, the DCF886 has a brushless motor. The brushless motor gets more runtime out of the battery pack, it runs cooler, and it will have a longer lifetime overall. If you plan to use your driver a lot, it makes sense to buy brushless over brushed. The maximum torque rating on the DCF886 is 1500 inch-pounds. It spins and hammers up to 2800rpm and 3200ipm (impacts per minute). All this power comes out of a little 2.1lb tool that measures only 5.55 inches back to front. There are three LED lights around the collar that do a great job of illuminating where you’re working. They stay lit for 20 seconds after you release the trigger. Since this is the DCF886B model, the “B” means “bare tool.” It doesn’t come with a battery. 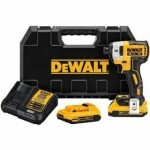 But it is compatible with any of DeWalt’s 20V MAX XR lithium-ion packs. 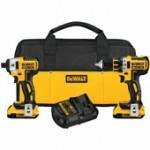 DeWalt offers a 90-day money-back guarantee, a 1-year free service contract, and a 3-year limited warranty. Here is the DCF887 impact driver, which also has a brushless motor. Again, that means it will run for more time on a single charge than a brushed motor. It also runs cooler and a little quieter. The brushless motor puts out a hefty 1825 inch-pounds of torque at speeds up to 3250rpm with 3600 impacts-per-minute. That’s in high gear. Go ahead, sink 3-inch screws in redwood. Hang sheetrock all day. It’s ready to do the work for you. It has a total of 3 gears in its all-metal transmission. In fact, it’s the transmission that makes this driver just a little heavier than the DCF886. It weighs 2.65 pounds without the battery. The 3-speed transmission with a variable-speed trigger will help you do precision work too. If you need to work in tight areas, you may also appreciate that it measures just 5.3 inches back-to-front. Since this is a driver with a ¼” hex chuck, you’re limited to bits with hex shanks. But changing bits is really easy. Slide back the sleeve, pop in the bit, and you’re done. You can do that with only one hand. This driver will also accept bits as small as 1-inch long. Around the chuck are three LED lights just like on the DCF886. These operate on a 20-second shutoff delay, and run off the tool’s battery. The DCF887B doesn’t come with a battery pack, but it is compatible with any of DeWalt’s 20V MAX XR lithium-ion packs. 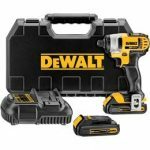 The DCF895C2 comes with two battery packs, and that’s already a selling point if you don’t have DeWalt batteries already. Why would you want this one instead of the DCF887 or the DCF886 described above? For one, this driveris just a little bit smaller, measuring 5-1/4” inches back-to-front. If you need to drive fasteners in tight spots or overhead, this one may be just what you need. It weighs just 2.2 pounds, or 3 pounds with the battery. On the downside, its maximum torque is just 1500-in-lbs, less than the DCF887 and the same as the DCF886. It’s also not as fast. The 3-speed transmission offers three gears: low at 0-950rpm, medium at 0-1900rpm, and high at 2850rpm. The blows per minute that accompany these three speeds are 1300, 2400, and 3300ipm. So the trade-off for its smaller size is that it has a little less power and speed. Like the other two drivers in this review, the DCF895 has a brushless motor. 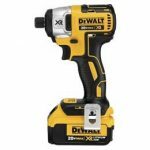 DeWalt says that gives it 57% more runtime than a driver with a brushed motor. Being an impact driver, it doesn’t have a clutch like a drill. It has a 1.4-inch hex chuck that only accepts hex shank bits. Pull back the sleeve, insert the bit, release the sleeve, and you’re ready to drive. The DCF895 also has three LED work lights around its collar. They turn on when you press the trigger, then shut off after 20 seconds. Since there are 3 lights instead of just one, they don’t cast shadows on your work area. DeWalt includes two lithium-ion battery packs with the DCF895C2. If you haven’t tried lithium-ion batteries yet, you’re going to love how long they last and how light they are compared to Ni-Cads. These packs charge in less than an hour, but you can also top them off on your break because they don’t have memory effect. That means you won’t reduce their capacity by charging them when they aren’t empty. If you want the most power and flexibility combined with a brushless motor and compact size, get the DCF887. Its 3-speed transmission will give you plenty of control, and its maximum torque is the highest out of these three drivers. It comes as a bare tool, but is a great investment. If you don’t need or want three gears, and just want a simple, powerful impact driver, get the DCF886. Just remember it comes as a bare tool, so you’ll need to get batteries too. 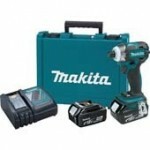 If you want a complete kit with an impact driver, batteries, and charger all ready to go, get the DCF895. It’s not as powerful as the DCF887, but it’s still a precision workhorse. It’s also the most compact of these three drivers in this review. 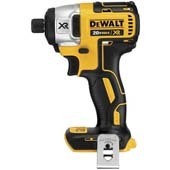 Click here to purchase DEWALT DCF886B on Amazon! 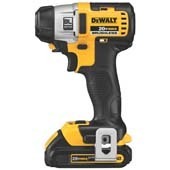 Click here to purchase DEWALT DCF887B on Amazon! 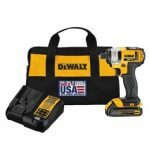 Click here to purchase DEWALT DCF895C2 on Amazon! Fantastic article detailing the differences. I was previously confused with the various Dewalt model numbers, but appreciate the information.